For the past 20 years, our house has been configured as a lower duplex with a top floor rental. Having lived under people for 95% of our married life, it was time to change that. We decided to reconfigure the Pink Lady into a Garden rental and an owner’s duplex on the parlor and top floors. Since we’re just regular people with regular jobs, we have to carefully prioritize the reno and re-arranging the house is going to have to be done in steps. This decision is not without consequences: a top floor kitchen and dining room next to the bedrooms and a guest bedroom off the living room. The focus right now is to get the apartment finished and rented out. Basing our Garden apartment reno decisions in our “extensive experience” as tenants, we chose to make the existing kitchen smaller and the living area bigger. 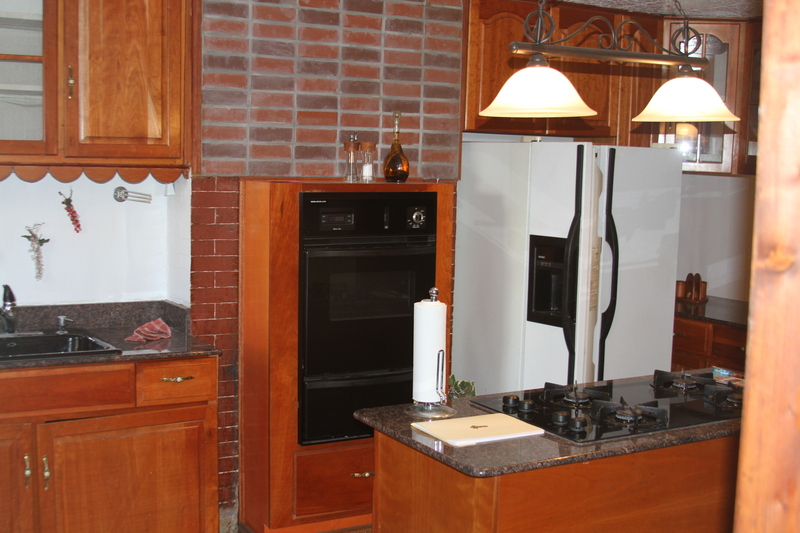 We removed the kitchen island, which served the single purpose of housing the cooktop. 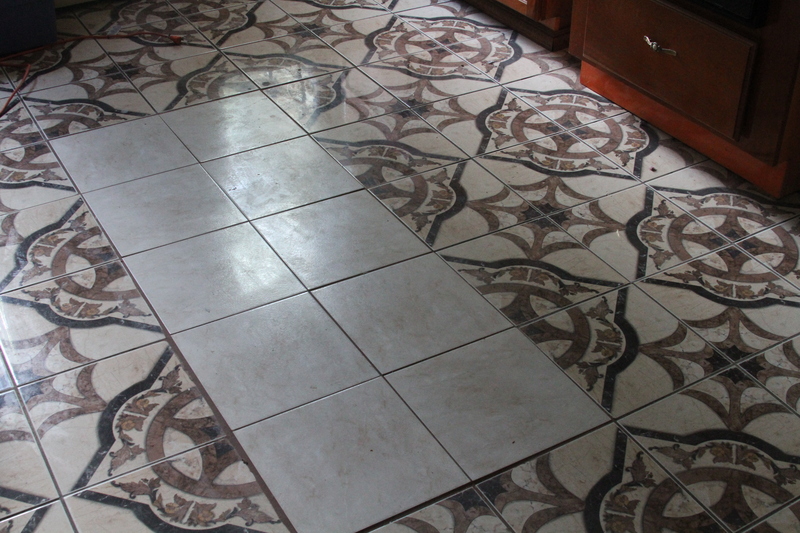 The previous owners, for some reason, didn’t tile under the counters, so we were left with the impossible task of matching this awful tile (impossible), since replacing the whole floor is cost prohibitive right now. Exhibit A: Why you should always tile under the counters. It may come as a shock to you that the old kitchen tile cannot be found anymore. The best (!) match we were able to find is this off-white marble-ish tile. It’s not pretty, but it is what it is. For now. With the island gone, the next task is to purchase a stove. Since the oven and cooktop used to be separate units (such a waste of space), removing one requires the removal of the other. The new range is going in the space currently occupied by the built in oven (which is the absolute smallest oven I have ever seen – I don’t think you can fit a standard size cookie sheet in it). The built in oven takes up a ton of space, yet this beast is absolutely tiny on the inside. The fridge is ugly but in good shape, so it will stay. 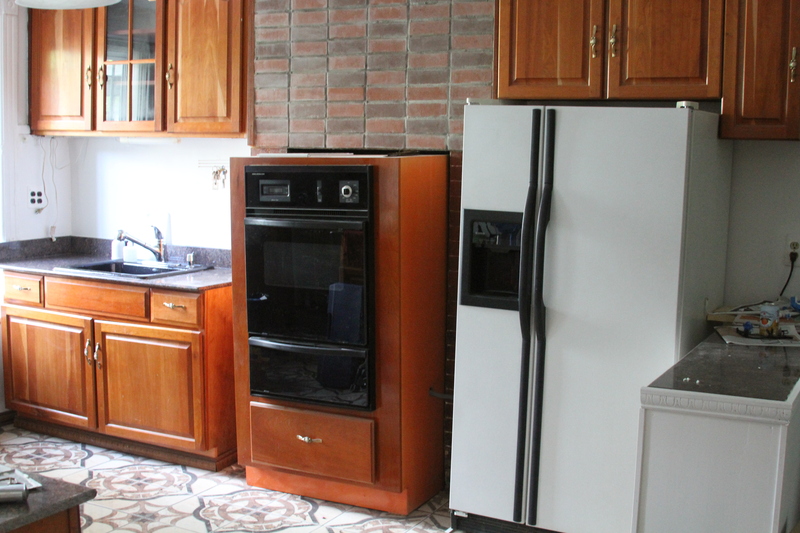 Since it’s a giant white thing, might as well buy a white stove to match – woo hoo!